I'm new to this forum. Hope is OK that i'm posting this here. I recently found these in a large Bionicle lot. So i hope you can help determing the value, or if it's going to recycling. green arm = The plastic is softer than those with part number. 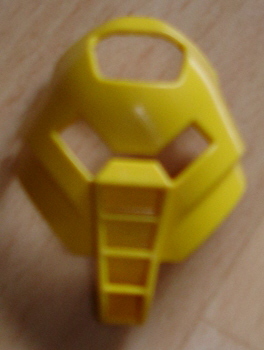 Most of the masks in the second batch can easily be looked up on Bricklink, as can the head. The yellow mask and green arm, however, aren't familiar to me. It's hard to tell the plastic quality from the photos, but I'd say they're either misprints, prototype parts, or third-party 3D prints or molds. If one of the former, then there's no easy way to determine their value. If the latter, then it's likely that they're not worth much at all. But again, it's hard to tell. The edges of the molding on the yellow Huna look a bit off from the original, namely in the mouth peg wich should have thick walls and a smaller hole in the center. Just going by that one detail, I'd say it most likely fits into the "prototype parts" category, or it's a deliberate modification to the mold by a third-party to differentiate their mold from the original. The grey head isn't the same as on bricklink, they are different. i just found this link, and it's look like the mask i have. http://www.brickshel...ry.cgi?f=207307. I'm holding one of the heads in my hand right now. How is that one different from the BL listing? Yeah, minor differences like that make it hard to differentiate between prototype parts and third-party copies. Correct me if I'm wrong, but don't prototypes still have serial numbers? They're just not the standard part numbers. The only prototypes I've seen images of are the prototype yellow ruru, the prototype mata masks, and prototype transblue ruru. All of those all had very distinctive numbers on the front of the mask. I would guess the huna and green arm around third party pieces. Even if they are third party, I know some would interested in the green arm for mata nui online game matoran mocs. Some might be interested in the yellow huna for similar reasons. I've heard of the all black kanoka, but don't know enough about it to know what it's worth. Correct me if I'm wrong, but don't prototypes still have serial numbers? They're just not the standard part numbers. 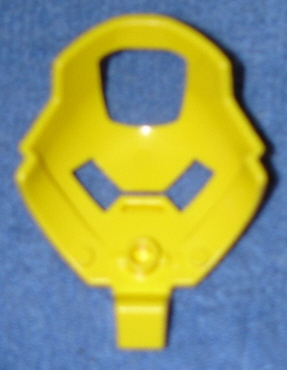 The only prototypes I've seen images of are the prototype yellow ruru, the prototype mata masks, and prototype transblue ruru. All of those all had very distinctive numbers on the front of the mask. This is mostly true. We've seen other prototype parts that didn't have obvious serial numbers on them. Usually, the color was different or the plastic quality was different to signify them not being the final product. The odd molding of these parts is what's throwing me off. They're close to the official part, but at the same time, their differences seem so uniform that I'd assume they 1) came from a faulty batch, which could result in the color being different for the masks and arm, or 2) they're mass-produced third-party items that managed to sneak their way into someone's collection. This mask was probably a prototype. Only one is known to exist. It is owned by BZP member KayTee. The yellow Huna has never been sold and cannot be given a specific value, but it would likely sell for higher than the white Huna or brown Komau since it’s thought to be one-of-a-kind. It may be worth trying to get in contact with KayTee to see if what the two of you have is the same thing.I would agree with The 1st Shadow that it's going to be difficult to put a price on prototypes that have never been sold before, but I'm sure there are people here that would be interested. Let me know if you decide to sell. You are a very wise Turaga. Be that the case, that record was based on information we had way back when. Knowing there are more of them in the world would bring their presumed value down by a hefty margin. What intrigues me most, if they are prototypes, is how many of them there are. I'd understand one or two, as true prototypes are hard to come by anyway, but as many as you have there is what made me consider they might be fakes. Honestly, I was thinking the same thing. 10 identical prototypes appearing in the exact same lot seems fishy to me. Personally I don't buy that they're prototypes, but rather some little known bootleg from 2001. I'm sure some people would still be willing to buy them on the off chance they are prototypes though. Maybe they are prototypes, bootlegs or even fake, I dont know. But if mine are fake/bootleg, then all your "prototypes" could be fake/bootleg. In fact, I had sorted them all out and "marked" to throw them away, because i thought they maybe was fake. But what i have learned from buying/selling Lego, is that you should always research first, and then i found this forum. But these "prototypes" were part of a trade, with all the bionicle parts that are currently for sale in my Bricklink store. I still need to sort some new bags, where I know that there is a minimum of 20 new Infected Hau.